Peter Gabriel, Johnny Depp, Tom Morello and Nadya from P—y Riot are among the artists taking part in the Voice Project’s “Imprisoned for Art” campaign, which aims to raise awareness and funds to support free expression. 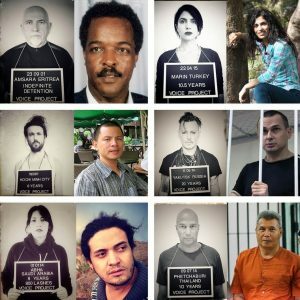 Edward Sharpe and the Magnetic Zeros’ Alex Ebert and Ana Tijoux are also involved with the project, with each artist photographed as a mug shot signifying a real person who has been imprisoned for their art. Gabriel holds a slate that reads “Amsara Eritrea, Indefinite Detention,” a reference to writer Dawit Isaak, who was been held in prison in Eritrea since 2001 without trial after being labeled a traitor by the government. Depp’s photo is a tribute to Ukrainian filmmaker Oleg Sentsov, currently imprisoned in Russia on suspicion of plotting terrorist acts for his role in fighting the Crimea annexation. 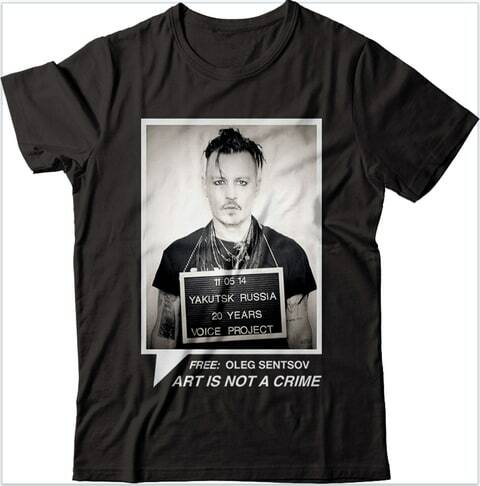 Each photograph will be printed on a T-shirt that will be available for purchase, with proceeds benefitting the organization alongside efforts to free the imprisoned artists. Visit the Voice Project’s Represent page for more information. Ebert’s shirt is dedicated to singer Trần Vũ anh Bình, currently imprisoned in Vietnam, while Morello’s shirt is for Thai singer Tom Dundee, behind bars for “offending” the Thailand government. Tijoux’s shirt honors the poet Ashraf Fayad being held in Saudi Arabia. From Rolling Stone, click HERE for full story.